Welcome to the FAQ page for Faith® Guitars USA. If you cannot find an answer to your question here, contact us at info@connollymusic.com. How do I become an authorized Faith Guitar dealer? We are asked frequently about artist endorsements. Please understand that Faith Guitars can offer only a limited number of endorsements. Those Faith guitar players who are chosen pay an agreed artist price for their instruments. You may contact our Artist Liaison about this. We are always happy to hear from anyone who owns a Faith guitar. You can also add your own pictures, music, video and opinion on our Facebook page. Do not apply polish to satin-finished or unlacquered areas - such as the back and sides of the Faith Natural or Trembesi series. Make sure to test the polish on a small, inconspicuous area first to check for any unexpected reaction between polish and lacquer. After every use, we recommend wiping the body and strings with a dry, lint-free cloth. Solvents sometimes found in plastic, leather, or vinyl (used on accessories such as straps or stands) can also tarnish the lacquer over time, so keep a watch on any areas that start to discolour. Perspiration can also tarnish the finish of your guitar as well as leave oily residue on the strings. For advice on cleaning Faith Naked guitars, please see the section above. The simplest way to keep your Faith Guitar clean is with a lint-free cloth. A regular wipe will keep dust and dirt at bay. Guitar polish should be applied to lacquered areas only with a microfiber cloth. Always loosen the strings before removing them. Do not cut them at tension. Remove the bridge pins using your fingers or a specially designed "pin puller" available from your local music store. Acoustic guitar strings have a metal ball on one end and a plain end at the other. Once the bridge is removed, the metal ball end is to be placed into the appropriate hole in the bridge, and pushed through so that it is approximately an inch inside the body. Then the bridge pin is inserted back into the hole with the long groove facing toward the neck (if it has a groove). Once the pin is partially re-inserted, hold the pin, and pull the string through thus securing the ball end. The bridge pin then secures the ball end against the bridge plate. 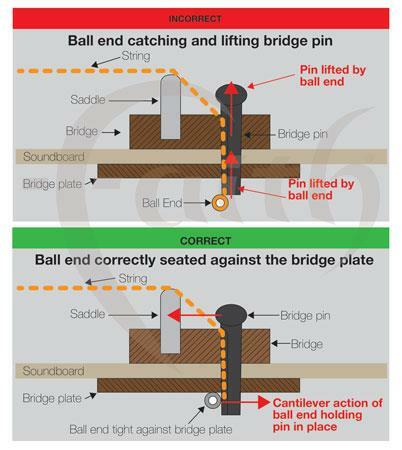 The ball end should not be directly underneath the bridge pin, because if it is, the pin will push out of the hole. The pin is held in place by a cantilever action rather than all-round friction within the hole. Once fitted correctly, the bridge pin should be pushed back fully into place with a thumb or finger. Do not hammer or glue the pins into place. Over time, the strings on your Faith guitars will gradually become tarnished and lose their brilliance. When this occurs it's time to fit a new set of strings. Faith Guitars are fitted as standard with coated strings (12 - 53 gauge). Coated strings will offer a longer lifespan and increased brilliance. If you are fitting particularly heavy or extra light gauge strings, we strongly advise that you have the guitar checked out by a qualified guitar-technician, as various adjustments may be required to ensure the neck responds accordingly. We recommend changing all 6 strings at once. Changing only one string at a time can result in an unbalanced sound. We are often asked about re-fitting bridge pins after they have been removed to change strings. Many people are surprised to find that their Faith Guitar bridge pins do not wedge tightly into the holes. In fact, bridge pins should never been held in place by friction all around the hole. Rather, the bridge pin should be held in place by a cantilever action caused by the ball end of the string pushing against the side of the lower portion of the pin. When fitting new strings, it is often helpful to bend the ball end of the string in an 'L' shape. Then the ball end can more easily wedge under the bridge plate of the guitar - rather than just sit under the end of the pin, and push the pin out. When the ball end of the string is in the hole place the bridge pin back into the hole, and hold it lightly with your thumb. Then pull the string through until it stops. If the ball end is under the bridge plate as it should be, the pin will stay in place. See the below example images for more detail. Your new Faith Guitar is made of solid wood, which is a very good thing, as solid tonewood resonates much more effectively — and therefore sounds much better — than the laminated plywood found on many other inferior instruments. Solid wood is also much more susceptible to changes in humidity, continual air conditioning, or extremes of temperature. Increases in humidity will cause the wood to take on more moisture from the surrounding air thus causing the wood to expand. And decreases in humidity will result in moisture being lost from the wood and the wood shrinking as a result. If these changes occur quickly, the tone woods may split or bow. The neck my move or twist unnaturally. Or the glue may weaken, causing problems with joints, bracing, or bridge integrity. So, rapid changes in humidity — either up or down — are to be avoided at all costs. The texture of the wood becoming very pronounced with the lacquer noticeably "sinking." The fret ends becoming "proud" of the edge of the fingerboard. The top or back of the guitar arching inwards, or sinking. The simplest thing - Buy a guitar humidity control system from your local music store or online. There are a number to choose from, and are not expensive. They come with full, simple instructions. When not in use, keep your guitar laid flat in its case with the lid closed. Do not place your guitar near a radiator, fan heater, or other source of "dry heat." The air immediately surrounding the guitar will rapidly lose its moisture, and problems could occur. It is advisable to avoid hanging your guitar on an outside wall inside your home. During particularly cold months, the temperature and humidity acting on the back of the guitar will differ from the front. If your guitar is exposed to freezing temperatures, once taken indoors we advise that you leave it in its case to reach room temperature more slowly. Please note that problems caused by failing to take proper care of your instrument are not covered by your warranty. We recommend you seek professional advice from a professional guitar technician before adjusting the action of your guitar. Incorrect adjustments may permanently damage your instrument. Do not adjust the neck truss rod without a full knowledge of the implications. There is an Allen key / hex key included in your Faith Guitar case if you do wish to make adjustments, however. With the headstock facing away from you, turning the Allen key clockwise will tighten the truss rod, reducing the neck relief (straightening the neck) and conversely turning the Alley key anticlockwise will loosen the truss rod, increasing the neck relief (allowing more neck bow). The truss rod should be adjusted no more than one quarter turn at once, after which a few minutes should be allowed for the neck wood to re-adjust itself before further adjustment. However, adjusting the neck truss rod is not simply an easy fix for a high string action. See your local guitar technician for a full diagnosis of the cause of any unduly high string action. Most guitars need to have a slight concave bow to the neck. A dead straight, flat neck is rarely the ideal setup. All Faith Guitars sold in the UK will go through Patrick James Eggle's workshop to have a pre-delivery cosmetic inspection, action check and basic setup. Faith Guitars sold in the U.S. will be inspected and treated in a similar way, by Connolly Music. The goal is for each guitar to arrive ready to impress and delight those who play it. However, once the guitar reaches the store, it is their responsibility to ensure that it remains in top condition. Bear in mind that due to changes in weather and humidity both inside and outside the store, guitars will move, especially when they are very new and adjusting to a new climate. And as much as we would like to see every Faith guitar sold within minutes of it arriving in a store, the reality is that the guitar you are playing or buying may have been on the wall for a period of time. During that time, the store should have taken care of its condition. Remember that Faith Guitars - and others - are made of solid tonewood. Wood can and will move as it acclimates to its new home in a warehouse, a music store, your living room, or a studio. Your guitar will need adjustment once or twice a year, and this will probably cost a few dollars. Guitars are living breathing things...kind of. By their nature, they are not household appliances like refrigerators, stoves, or a TV. What feels, looks, or sounds amazing to you may differ from what is perceived by someone else. Every piece of wood is slightly different in look, tone, and feel. And since Faith guitars are handmade (not from a big, machine-controlled production line), areas such as the neck may have marginal differences in feel. We always recommend buying guitars in a store, where you are able to test the actual guitar you will be buying. This is the best way whenever possible, as you can inspect it, and test the feel and sound to make sure it "hits the spot." Don't be afraid to ask the staff about a setup if you feel the guitar needs it. The staff may be able to offer advice as to why the guitar is the way it is. Or if there is a problem, all good retailers will naturally want to sort it out. When buying online, you will have a guitar delivered that you have never played. If it doesn't feel quite right, you'll have to set it up yourself, or arrange it with the store it came from. Unless the retailer expressly states otherwise, you must assume that the guitar will not be setup well. It may be...but there is no absolute guarantee. Remember, the guitar you are buying may have been in a box in a storeroom for months prior to sale. Always ask whether it will be checked over or setup prior to shipping. Sometimes though, guitars do develop problems that need attention. The store will be at hand to arrange any service that is required, and they are your first port of call in this instance. Naturally, Connolly Music is here to assist the store as and when necessary. Whether you're taking your Faith guitar on the school bus or the tour bus, don't forget that your instrument is more than just another piece of baggage. Ideally, when traveling by car, place your guitar in its case flat on the backseat. Don't put it in your car's trunk or cargo area. They experience greater fluctuations in temperature and are rarely ventilated properly. When traveling by plane, we recommend using a specific flight case for your guitar. These are often made of ABS plastic or aluminum, and offer the maximum level of protection for your instrument. When possible, carry your guitar to the gate, and check it with the airline's agent at your gate (if you can't bring it on board). That way it will be handled with greater care and you can collect it at the gate as you deplane. If the instrument is traveling in the aircraft's baggage hold, we recommend loosening the strings and keeping the instrument as tight inside the case as possible. How to use the Digital Tuner on a Faith Guitar preamp. The tuner function on the Shadow Performer-Tuner preamp is chromatic. Therefore, you have more tuning options than if it were just guitar notes, EADGBE… This allows you to use it to tune any alternate tuning you choose. Press the tuner button. This turns the tuner function on, and cuts the output of the preamp if you are plugged into an amp. NB: If you do not turn off the tuner after use, the battery will drain. Pluck a single string. One of the LEDS will light up to show you to which note the string you plucked is currently tuned. (You do not need to tell the tuner which string you want to tune. It will ‘hear’ the note on its own). For example: If the LOW E is actually de-tuned a lot, the LED may display the note D or C. In this instance, you would know that the string needs to be tuned up quite a bit in order to get to the desired note, E. If the LOW E is actually tuned too high the LED may display an F or a G. In this instance you would know the string needs to be detuned to get to the desired note, E.
When you adjust the tuning peg on the guitar, the tuner LED will change to indicate the current note to which the plucked string is tuned. The LED lights will change as you turn the tuning peg, gradually cycling through the notes as the pitch changes. When the string you are tuning reaches the note you want (the note you want is highlighted on the LEDs), the left-hand cluster of three LEDs come into play. These three LEDS say “HI / Tune / LO.” They indicate whether the string is sharp, flat, or perfectly in tune. For example, if the Note LED says "E" and the "HI" LED is showing too, then the string is tuned to an "E," but is a little sharp. Likewise, if the "LO" LED is showing, then the "E" is a little flat. The string will be tuned to a perfect "E" when both the "E" LED is showing – AND – the "Tune" LED. Now the note is correct and it is neither too sharp nor too flat. Continue this process for the other 5 strings, and you will shortly have a perfectly tuned guitar. Faith Acoustic Electric guitars use a standard jack socket/strap button arrangement, the same as many other manufacturers. As a result, the strap button size is a fair bit larger than a regular "standalone" strap button, and so we're often asked about how to get the strap fitted onto this larger button. There is no special answer. Rather, it's just a case of solving the problem in a practical way. Thousands of people use straps on these larger buttons every day, but we do understand it's often much more difficult — and on occasion plainly impossible — to get some straps strap to fit over the jack socket button. Find a strap with softer leather or fabric ends. These can be manipulated and stretched much more easily than rigid or very thick leather ends. The simplest solution is perhaps this: Fit a second strap button. All you need do is visit your local music store to buy a standard strap button. They are very inexpensive. With the guitar laying on its back, the new button should be positioned above or below the existing jack socket, along the vertical line at the bottom of the guitar - where the two sides meet. If you are not confident in doing this, while you're in your local music store, just ask their guitar tech to fit it for you. It won't take more than a few minutes. Once fitted, you will be able to use any strap you like. Why does my guitar feedback when amplified? For years, luthiers have been trying to make acoustic instruments as resonant as possible. Using solid timbers - as Faith Guitars do - is one of the very best ways to do this, and as the instruments are "played in" and as the wood matures, one would expect it to be become more resonant and sweet-sounding. This is basically because the wood is gradually moving more freely, and is exactly what you want from an acoustic guitar! Likewise for many years, musicians have wanted to amplify their acoustic instrument. But they have often encountered the dreaded issue of on stage feedback when they get to a certain volume. This is essentially why solid body electric guitars became the obvious choice for rock-n-roll bands. Plus, every guitar has its own "resonant frequency." So sometimes you'll find that a certain note sets off feedback more than any other. This is simply because your guitar is sympathetic to that frequency, and in itself, nothing can be done to change this. But over time, you may find that the resonant frequency changes, as once again the solid timbers mature further. The bottom line is: the more resonant the instrument, the more feedback you may experience at higher volumes. It's a sign of a good acoustic instrument. So, how can I combat feedback? Use a feedback buster or feedback blocker. These cover up the soundhole so that less sound can get back into the body of the guitar to be picked up and amplified again, thus creating a feedback loop. If your instrument has a "Phase" button on the preamp, this usually does the trick. If you experience feedback, then a push of the phase button will enlist the help of some simple physics which will cancel out the frequencies that are causing it. Use a microphone instead. Most professionals will always record their acoustic guitar with a mic in a studio, and doing the same on stage will allow the sound engineer to control the levels and therefore eliminate the problem. Plus, you will get the real acoustic sound of your guitar — which is why you bought it in the first place. Don't drive the preamp on the guitar too hard. We would recommend that the volume knob should be no higher than 3/4 (3 quarters). It is better to drive the PA, amp, etc. than the guitar itself. Make sure the pickup under the saddle is making proper contact with the bottom of the saddle and the bridge. The pickup should lie flat with even contact all along its length. A guitar tech could check this out for you. If there are gaps between the bridge, the pickup, and the saddle, then this can cause its own little feedback chamber. The Shadow Nanoflex pickup cables are intentionally microphonic and should be clipped into a plastic clip about an inch or so after they come through the bridge into the body. This clip stops the microphonic properties from that point forward. So you get a basic microphone effect as well as the undersaddle pickup tone. So... If the cable is not clipped properly (if it slipped out, etc.) then the cable would act as a big microphone in the body and is likely to feedback a lot. Nanoflex Pickup Cable oscillation The pickup cable comes through the little hole in the bridge into the body cavity. Sometimes the resonant frequency of the guitar causes the pickup cable to oscillate in the hole, causing what seems like feedback. With the simple addition of a little white tack inserted into the hole (from inside), it stops the cable from being able to oscillate, and usually improves the situation. This fix has been used on a number of guitars over the last few years. It just seems that some instruments are especially resonant at certain frequencies which cause this to happen, and it can’t be engineered out, as each instrument will resonate differently. Can I buy directly from Connolly or Faith? No. But you can buy any Faith model available in the U.S. from our dealer network, in store, or here at our website. Can I order spare parts directly? Yes. Email us at: info@connollymusic.com and include which guitar model you own, its serial number, and the spare part you need. Where can I register my Faith guitar? Register your Faith Guitar here. When your purchase your guitar, a postcard is included that gives you directions to a URL. That's where you can enter your guitar's serial number, purchase, and contact information. If you have any trouble, contact us at info@connollymusic.com. For general advice and tips about how to keep your Faith Guitar sounding and looking its best, read these guides. IYour Faith® guitar is warranted to be free from defects in materials and workmanship for as long as it is owned by the original retail purchaser, except that pickups, jacks, controls, all other electronic components, tuning machines, hardware, pickguards, cases and case hardware are warranted for a period of one (1) year from the date of original purchase. This warranty applies only to the original retail purchaser when this instrument is purchased from an Authorized Faith Guitar Dealer in the USA and is subject to the limitations set forth herein. Faith Guitars reserves the right to use materials regularly utilized at the time of repair in the event that original materials are no longer available. IMPORTANT: PLEASE RETAIN YOUR ORIGINAL SALES RECEIPT, AS IT IS YOUR PROOF OF PURCHASE VALIDATING THIS LIMITED WARRANTY. Here are the full warranty details. In the event of malfunction of your Faith® guitar, you should notify your authorized Faith® Guitars dealer. The dealer will contact Connolly Music for information and authorization to return the instrument to company headquarters if necessary. The dealer or owner must ship the instrument freight and insurance prepaid. No instrument may be returned without prior return authorization. Service performed by unauthorized persons will void this warranty. When returning an instrument to Faith Guitars, a copy of the sales receipt establishing proof and time of purchase must be sent with the instrument. Our Faith team in the UK recognizes the importance of an ethical and sustainable manufacturing process, and we know this also concerns many of our current and future players. Faith guitars are made in West Java, Indonesia using many hand-building and hand-finishing techniques that deliver the quality you have come to expect. There are no robotics or CNC machines. All workshops are climate-controlled to the appropriate level depending upon the particular process taking place in that location. We also treat our staff well. They are appropriately trained and our retention levels are high. Indonesian legislation ensures that any weekend or overtime work is paid at a higher rate, with regular hours being 8 AM till 5 PM, five days per week. Faith Guitars UK maintains constant contact with the workshops and our team makes frequent visits. We are confident that the conditions and ethics of these locations meet the high standards our dealers and customers expect. The spruce is Engelmann Spruce from North America or Canada. It is purchased through large US or Canadian tonewood merchants. Spruce and cedar tops come from FSC-certified sources. The rosewood, trembesi, and ebony are all from Java or Makassar. They have been sourced through local, government-approved timber merchants that use the government-approved timber certification process. Local sourcing also reduces the miles traveled by the tonewoods before manufacture. The timber is certified as legally obtained and government-approved. It is supplied to the workshops fully itemized and in plank form. Then it is cut and spliced in house once it has fully dried and matured. Does Faith Guitars use animal hide-glue? Yes we do, but only to fix the fingerboard to the neck. On all other joints, Faith uses regular white glue. For centuries, animal hide glue has been used in the construction of musical instruments, and it is still thought by many to be the best choice for an authentic finish. Therefore, like 99% of traditional guitar builders, we use this traditional hide glue for fixing the end of the fingerboard to the body. This makes it possible to remove the glue with heat if the neck were ever to need removing. However, it means we cannot be vegan-friendly. Hide glue is purchased from US guitar luthier merchants. How do I become an authorized Faith Guitars dealer? Connolly Music is the sole distributor of Faith Guitars in the United States. To learn about becoming a Connolly dealer, contact us at info@connollymusic.com.